WHAT ✧ A clumsy, Weebly little web site (www.BikeChapel.com) about cycling. Riding on two (or 3, Maddie!) wheels under your own power. On the road, on the trail, on the track. Racing & touring. WHO ✧ Dan "Father Tortuga" Goese is a San Diego cycling shaman, father, husband, brother, son, cyclist [SDBC member & ride leader], landlord, investor, nerd, philanthropist, former engineer (U of IL BSEE, UL), product marketing puke (Northwestern/Kellogg MBA, HP), startup booster (MusicMatch) & market researcher (Outlook Research). WHERE ✧ All over the world, but most often in coastal San Diego County, California. WHY ✧ Fun. Elation. Relaxation. Physical & mental health. Sightseeing. Environmentally-friendly commuting. Oh yes, and because--while billions of people are comforted by religion in a world torn by religion--ours won't tell you who or what to love, hate, worship, shun or kill. In our religion, you just ride when you can to brighten your day and brighten the lives of those around you. Smile & wave! Dan riding with Andy Hampsten in Tuscany. Click on photo to see more or visit Cinghiale.com to book a trip with Andy. Click on photo above to see photos from Lake Como & this "La Madonna del Ghisallo," the original church of cycling. It's like Mecca for cyclists, and a nice climb from Lake Como brings you there. ​NOTE: If you found the links from my original La Jolla Vélo site useful, they've been moved to the Cycling Armada here. "Cycling is a Religion." In addition to this little bike chapel, you can find salvation at another chapel or church of cycling. I've listed several below to guide you on your path to cycling salvation. As with every other religious organization, the cycling faithful have more than one official church. Let's face it, the Italians and Belgians are both pretty bike-crazy, so Belgium (Flanders, more specifically) has its ancient cycling church, too. Rouleur published an article with some great pictures about their visit to what they call the church of cycling here. Of course the great Eddy Merckx is the archangel (if not the god) of their church. Johan Museeuw is the monk in their awesome video here. I was raised Catholic and I firmly believe that the sheer size of the Catholic Church doesn't mean it's not a cult. 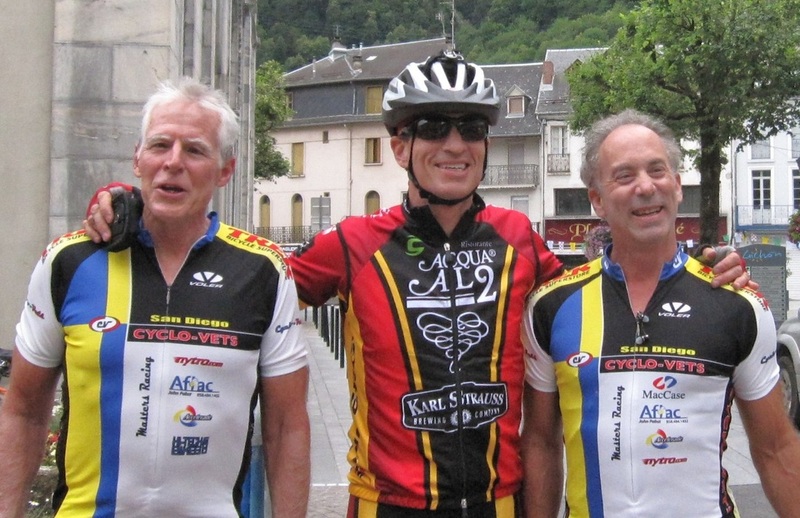 Of course the cycling faithful must have their own secret society or "illuminati" as well. In this case, it is cleverly called "Velominati" and they claim they are "keepers of the cog." Now there's a fabricated word that can be easily trademarked, unlike common phrases that have "church" and "cycling" in them. "Sorta like a religion, but more ethical." 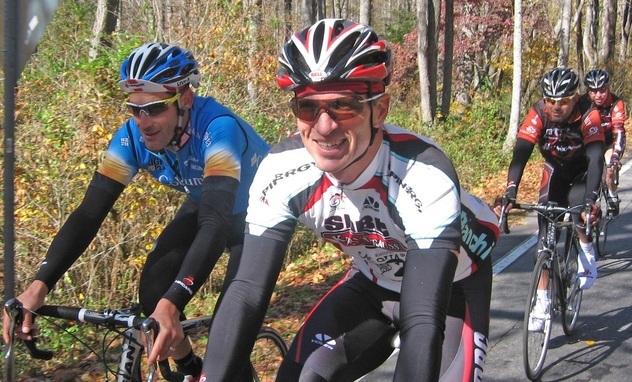 Dan riding with George Hincapie, his brother Rich, and his dad Ricardo in South Carolina. Click on photo to see more. 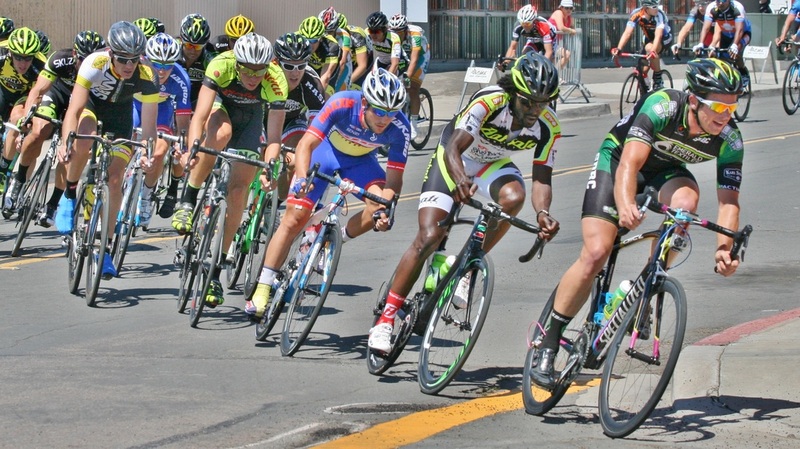 Pro/1/2 racers in SDBC's "Barrio Logan Grand Prix" criterium. Click on photo for more info. 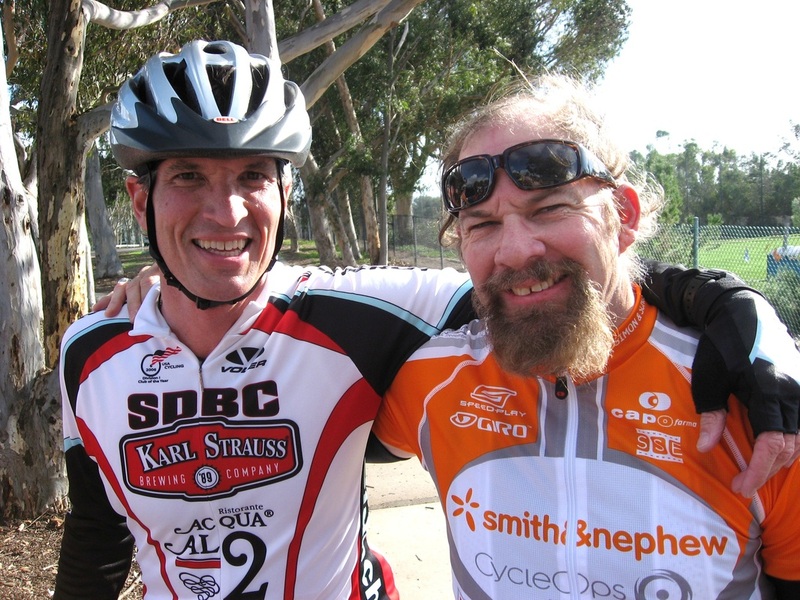 Father Dan at the top of Torrey Pines grade with Bob Roll. San Diego cyclists meet up at the Tour de France in 2010. 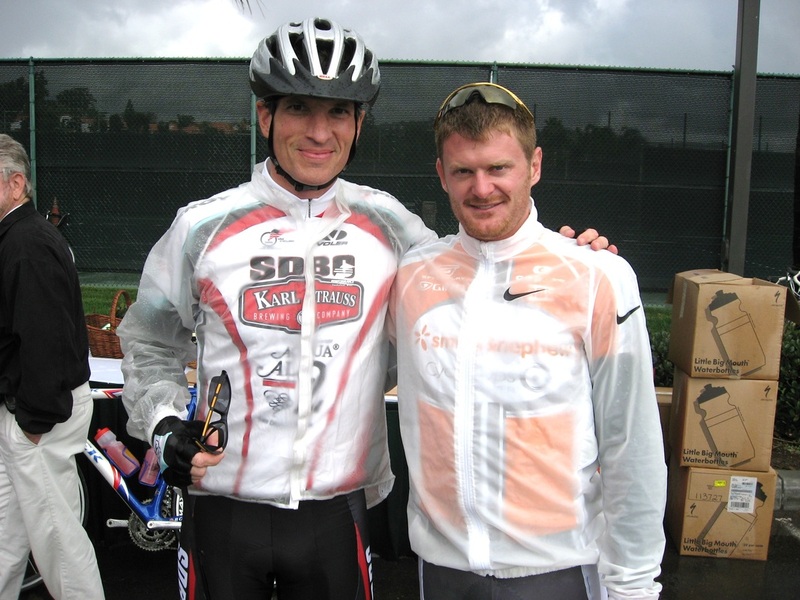 Getting ready to ride with Floyd Landis (2007).